Summary: Time is running out and Alfred Beagle's life is barely hanging on a thread. Worse yet, Helena Wayne has no idea how to save him because she doesn't know what Alfred's been poisoned with, and neither does the thug who fed him the poison. With anger and anxiety clouding Helena's thoughts, she does the one thing she never thought herself capable of: doing what's easy. Without time to investigate, Helena resorts to forcing the thug (identified as Fred) to tell her about the pill he gave to Alfred by threatening to kill him if he doesn't. With a very firm grasp on his throat, Helena begins to gradually block his breathing by putting pressure on his windpipe, which forces Fred to describe the pill to her in between chokes. Fred doesn't get very far before the other thug Helena took out earlier intervenes, effectively preventing Helena from hurting him further. Helena is also prevented from committing murder with the timely arrival of her boyfriend, Harry Sims, with the police to help diffuse the situation. The two thugs are apprehended and Alfred is quickly taken to a nearby hospital for medical attention. The doctors at the hospital are unable to identify the chemical compound that's killing Alfred because it doesn't match with any other known drugs, which qualifies it as a new drug. Not wanting to take any chances with Alfred's life, Helena decides to take matters into her own hands. Obtaining access to the hospital lab, Helena is similarly unable to identify the chemical compound that's killing Alfred. She blames herself for not being as skilled as her father in organic chemistry because she actually attempted to have a life as opposed to spending that life obsessing over all the different ways to combat crime. When Helena starts feeling incompetent, Harry intervenes to help her find the courage to keep going until she figures out a way to save Alfred. Eventually, Helena does figure out what's killing him and is able to save his life before it's too late. In the midst of all of this chaos, Harry Sims once again approaches Helena with the same question he had before: why does she risk her life every day to fight crime as the Huntress? Helena doesn't answer his question, but she does ask him if he is able to see her for the person she is and that she can't change that? She also tells him that she doesn't want to talk about what made her become the Huntress, effectively cluing him in on the fact that the events that led her to her superhero identity are too painful for her to discuss. She thinks to herself that her father's secret is his alone and that she must respect that. As such, she can't really reveal the reasons for her Huntress lifestyle without revealing his secret. In the story's epilogue, Helena and Harry go with Alfred to the grave sites of both of Helena's parents to pay his respects. In his thoughts, he tells his former master Bruce that his daughter turned out to be the person he had hoped she'd grow up to be. Review: It's my 30th birthday today, and I figured 'why not celebrate my third decade of life by reviewing the final chapter of a pre-Crisis Huntress story I enjoyed?' 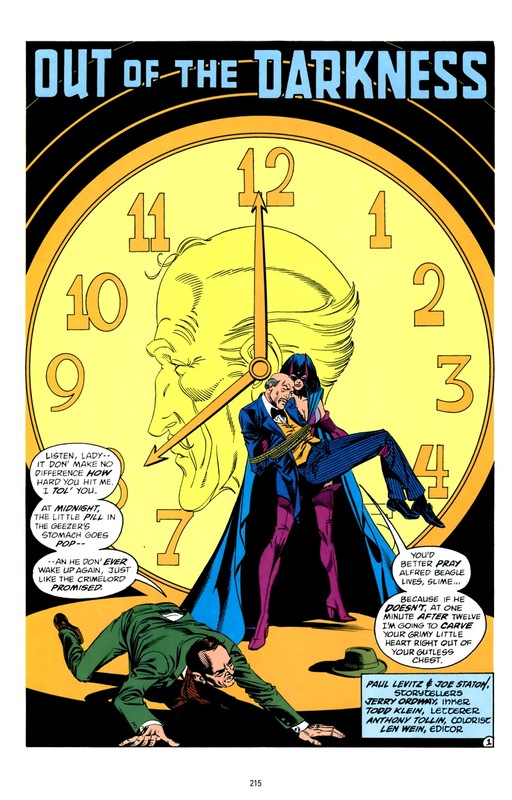 And this is a very significant chapter for the pre-Crisis Huntress for three reasons: First, it was the final Huntress story Paul Levitz wrote for this version of the character before handing over writing duties to future Helena Bertinelli creator, Joey Cavalieri. 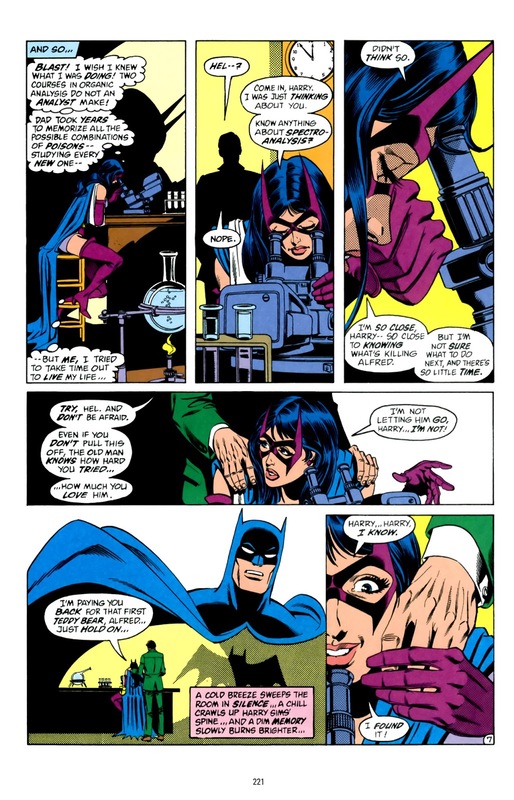 The second reason this chapter is significant is because it explored how far Helena Wayne was willing to go to save her own family, and it especially addressed the question of whether or not the Huntress is willing to kill. 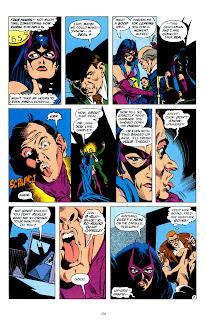 This willingness to kill not only continues to get addressed in Joey Cavalieri's run of the Helena Wayne Huntress, but it especially becomes a defining trait of the Helena Bertinelli Huntress that Cavalieri later created. 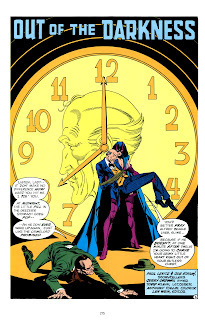 The third reason this chapter is significant is because it brings the exploration of Helena Wayne's relationships with the people in her life who are not the Justice Society full circle. It specifically addresses how her superhero lifestyle impacts those relationships. Every time I revisit this story, it always leaves a profound impact on me on all of those levels. I'd argue it's probably even the best Huntress story Paul Levitz ever wrote because of the themes he explores and how those themes cause Helena to change as a character, most notably during Joey Cavalieri's run. The Helena Wayne that we were accustomed to prior to this story was a very different person from the one we end up with at the end of this story. Prior to the events of this story, Helena was a bit arrogant and over confident in her abilities, and in this story she's a bit more mature and accepts that she's not good at everything. She also acknowledges the fact that she is not her father despite sharing many traits with him. The theme that more dominantly drives this story is the question of how far Helena is willing and even capable of going when the life of someone she loves hangs in the balance. The fact that she demonstrated her resolve to Fred (the thug) by actually choking him in addition to threatening to 'crush his throat' does in fact put more weight to her words than a mere death threat. She really does physically look like she is going to kill this man if he doesn't help her save Alfred's life, and this is actually best conveyed through Joe Staton's artwork. A combination of giving Helena a fierce look in her eyes and Fred looking genuinely scared of her does help convey the message that this is for real. Whether or not Helena would've Fred if Alfred had died during this confrontation does leave the reader thinking. On the one hand, this wasn't just anybody Fred was killing. This was Alfred Beagle, someone who's been with the Wayne family for two generations, and the loss of family through murder does make a person angry enough to want to commit murder. As such, I don't think it would've been out of character for Helena to revenge kill the man who killed the second to last remaining member of her family. This is someone she has a strong emotional attachment to, and no moral compass would've kept her from having those feelings. It is also for this reason that she needs relationships in her life. Suppose she had gone through this fight alone. What if Harry wasn't there to bring help in the form of the police? She definitely would not have been able to find the help she needed on time, she would've lost Alfred, and she could've actually committed murder. Had she actually crossed that line, it would've changed her life forever, and it would've made her question whether or not she deserves to continue functioning as an agent of justice either as a lawyer or as the Huntress. It would've changed what the Huntress represents to the people of Gotham and also to Helena herself. It would have devastated her in a very profound way that would've made her question her moral judgement and whether or not she's a hypocrite. 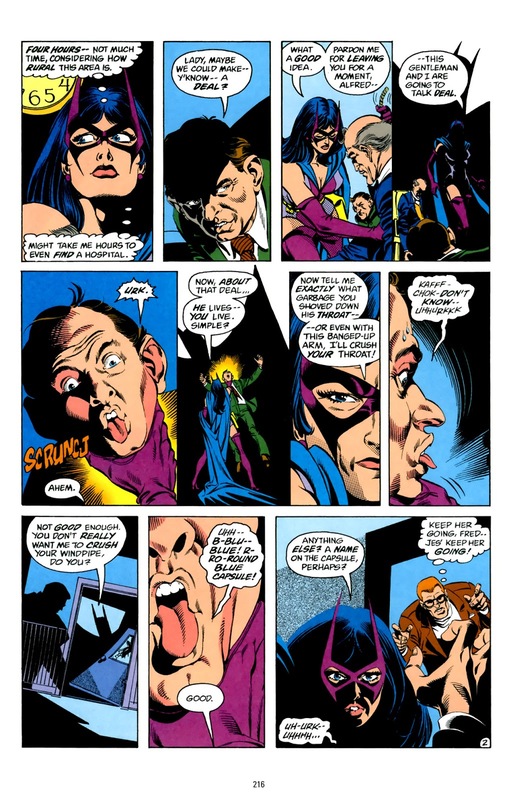 The other dominating theme in this story's conclusion is how Helena's activities as the Huntress affect the people in her life who are not the Justice Society. It clearly put Alfred's life in danger, but it also made it difficult for her to have a successful romantic relationship with an ordinary person without disclosing both her own secrets and that of her parents, both of which are dangerous knowledge. Since self-disclosure and open communication are two major building blocks for both building and maintaining healthy relationships, lacking in one or both is the surest way to end a relationship. In Helena's case, as much as she would like to say more about herself and where she comes from, she also knows that she cannot afford to do so without endangering both her life and the lives of other people she is close to, including her romantic partner. So the loss of a romantic relationship is an unfortunate sacrifice she has to make. Though Harry ends up telling Helena that he loves and misses her, Helena also knows that he doesn't accept her lifestyle, which will continue to create problems in their relationship further down the road. Though I didn't mention this at the start of this review, the last thing that got me thinking with this story was the weapon of choice that was used to threaten Alfred's life and how Helena Wayne came up with the magical cure to his ailment. This one is actually kind of personal to me because my academic background is in science. I was specifically disciplined in biology and psychology, which led to having to learn how drugs interact with the body (specifically the nervous system), which is a major aspect of neurobiological research. Within the context of this story, we have a pill made from an unknown chemical compound that is capable of making a person's stomach 'blow up' and kill the person. Since I obsess over science, it got me thinking 'what kind of pill can do that?' Obviously, in superhero comics, real world science rarely applies, but even DC Universe science often tends to have a basis in real life science. In this particular case we have a pill made from an unknown compound that can destroy a person's stomach, which does require a writer to have a basic of how drugs work. Obviously Paul Levitz doesn't have a science degree and couldn't get into those specifics for this story, but he does at least know that how a drug hurts a person depends on its chemical composition, which affects how it interacts with the body. Using my own knowledge of anatomy and physiology and how different drugs interact with the human body, I pieced together in my own mind how Helena figured out how to saved Alfred's life. First, she would have to understand how the digestive system works. Because the stomach is specifically designed to break down complex matter into smaller, simpler molecules the body can use for energy, the juices inside the stomach are highly acidic, especially hydrochloric acid which has a pH of -3. As such, the entire digestive tract has to be protected with a neutral mucus membrane to keep the stomach from digesting itself. If Stenville's new drug causes damage to the stomach, the compound would need to be specifically designed to block the stomach's epithelial cell's ability to produce this mucus membrane, effectively dissolving this protective barrier. You would then get a stomach that digests itself. If the pill 'takes its time' to cause damage, Stenville would've needed to encapsulate the deadly compound in a thick capsule that would take the stomach acid time to eat through. The second thing Helena would need to know to save Alfred's life is what compound to concoct to reverse the drug's effect, or better yet, prevent it from doing what it's designed to do. There are two ways Helena could accomplish this. The first is to create a buffer to help neutralise the stomach acids' pH and keep the stomach from digesting itself that way. The other way would be create a compound for that drug to bind to (kind of like a lock and key), effectively keeping it from reaching the stomach's epithelial cells and blocking mucus production. Since people do need their stomachs to be acidic for digestive purposes, I don't recommend the first option of using a buffer, so that leaves Helena with needing to concoct another drug to 'reverse' that other drug's effect. This is how I think she saved Alfred's life. She may not have been able to figure out what type of drug it was under the microscope, but she could still look at the compound's composition, and create another compound for that compound to bind to and keep it from doing what it needs to do. On the whole, this remains one of my favourite pre-Crisis Huntress stories of all time. I loved the themes Levitz explored with this story regarding Helena's moral compass and how her lifestyle affects the people in her life. I especially loved how that mysterious pill Alfred was poisoned with got me thinking, because it reignited my love of science and why I pursued a degree in this field in the first place. After this exciting and epic conclusion to Levitz' pre-Crisis Huntress run, we'll now get to start discussing Joey Cavalieri's take on the character for our next Best of the Huntress review!